Interests:leathercraft, history, cowboy action shooting, my family and kids. 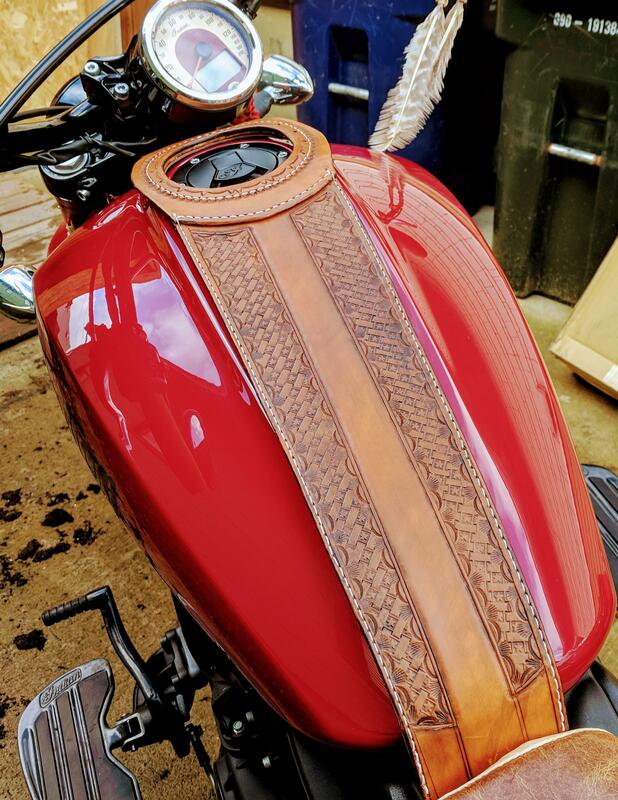 Made up a tank bib to fit the new Indian Scout. Now that I have the pattern down I am going to try to make up a few different styles. I am always impressed by these things. How, may I ask, are they attached? Oh wow! That looks sharp! Thanks All. The pattern matches my seat re-upholstery. This was initially going to be a plain prototype but I can't leave anything plain for some reason. It attached under the front of the seat via a hole that allows the front seat post to go through it. In the front it attaches by a strap that feeds through the tank bib and goes around the frame, in front of the gas tank. I will try to get some pictures to show what I mean. A lot of people use Velcro to attach it to the tank but I didn't want to stick Velcro on my tank and wanted to see if I could some up with a different way. Thanks for the details. I had no idea folks were using velcro! Explains a lot. I like your idea for attaching a bit better. Watch for gas split on the leather. Can damage the color. Thanks for the heads up and compliments. I will definitely be watching that.